Arsenal were up against SSC Napoli on Thursday night at Emirates Stadium. Unai Emery’s team knew that it would be important to get a positive result from the first leg in what would be a very difficult quarter-final tie against such a strong side. 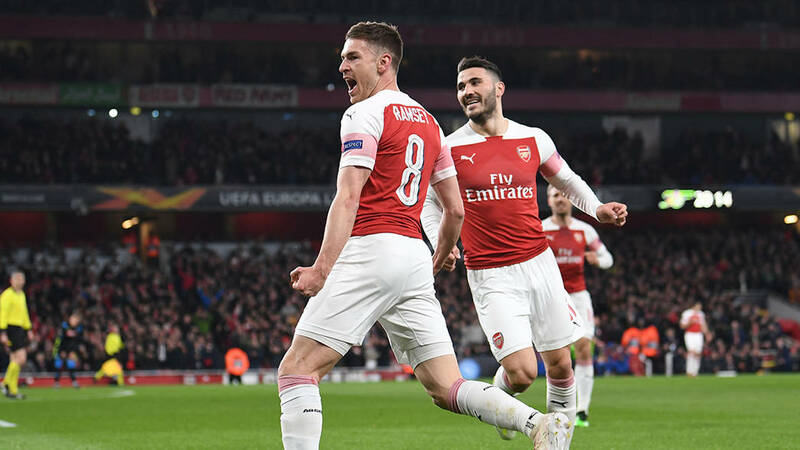 The Gunners got straight to work at a high tempo and it wasn’t long before both Aaron Ramsey and Ainsley Maitland-Niles were forcing the Napoli defence onto the back foot with successive shots that had to be blocked. With the Arsenal fans roaring the team on, the early momentum was with the home side and they took full advantage with a superb team goal in the 14th minute. After winning the ball on the halfway line, Ramsey, Mesut Ozil, Alexandre Lacazette and Maitland-Niles passed their way into the box and Ramsey finished into the bottom corner. Arsenal got the second goal just ten minutes later, through a Lucas Torreira shot from the edge of the box that took a deflection off Koulibaly and wrong-footed the goalkeeper. The lead could have been added to before the break by Pierre-Emerick Aubameyang, who came close on two occasions, but the teams went in at half-time with Arsenal 2-0 up. The second half saw Carlo Ancelotti’s Napoli side start strongly; they had a goal disallowed for offside and then Petr Cech had to make a good save to keep Koulibaly’s header out. Arsenal continued to carry an attacking threat and Ramsey, Maitland-Niles and Nacho Monreal all came close to getting the third. Zielinski and Ramsey both missed good chances in the last minutes of the match but the first leg ended in a 2-0 win to Arsenal. There’s plenty of work still to be done in next Thursday’s second leg. Arsenal now turn their attention to Monday night’s away game in the Premier League against Watford.